The center was inaugurated by H.E. Mr. Shaukat Aziz Prime Minister of Islamic Republic of Pakistan, on 4th February 2005 The building of TWC was named as "Prof. Dr. Atta-ur-Rahman Laboratories" by the Executive Board in 2011, in recognition of the outstanding services of Prof. Atta-ur-Rahman. 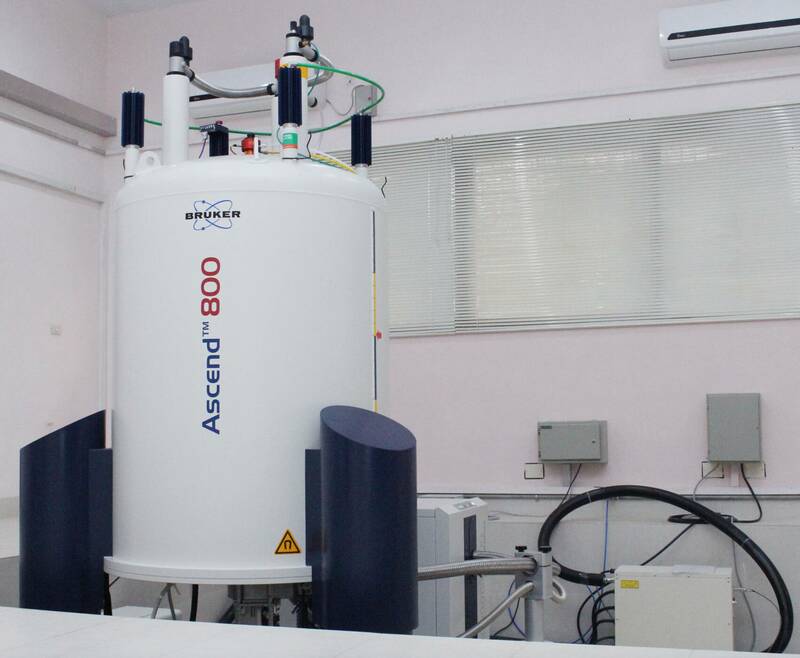 The 800 MHz Bruker Ascend NMR spectrometer is the newest addition to the NMR facility, of the International Center for Chemical and Biological Sciences. The equipment is featured with an Avance III HD console (5 RF channels, 2 receivers), equipped with a TCI (1H/13C/15N/2H) cryogenically cooled probe (with temperature control over -40 and +80 °C ) optimized for 1H detection (inverse probe), and also a RT probe. The Nuclear Magnetic Resonance (NMR) Facility at the ICCBS is a Core Science Facility established in 1982. 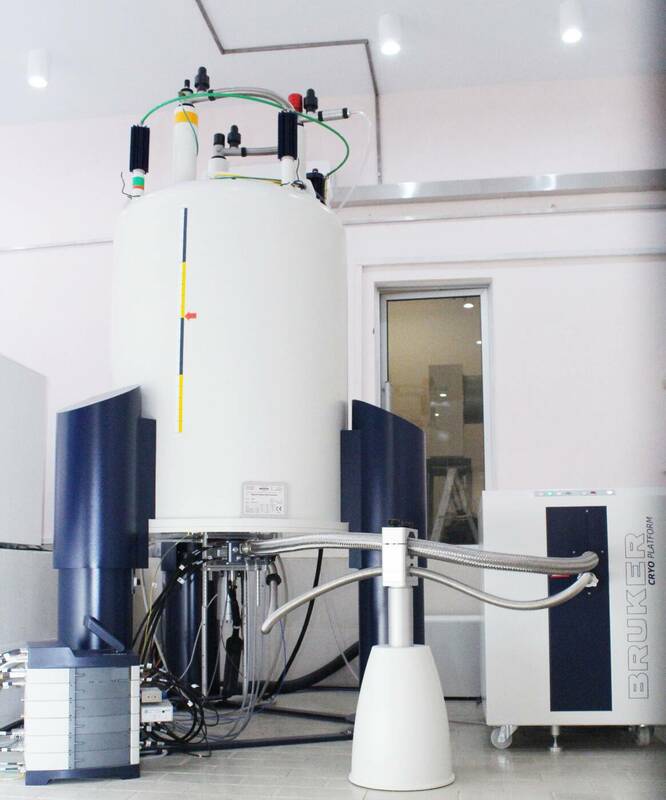 It provides access to qualified researchers in the physical, biological, and industrial sciences to state-of-the-art NMR instrumentation for spectroscopy. The Facility serves mostly undergraduate, graduate and post-doctoral researchers in the Chemistry and Chemical and Biomolecular Engineering Departments all over the country. The Facility presently operates thirteen superconducting NMR spectrometers (Bruker) of varying purposes and capabilities, including four instruments (one 800 MHz two 600 MHz and one 500 MHz) are equipped with cryogenically cooled probes, and one multinuclear probe to detect all type of elements. 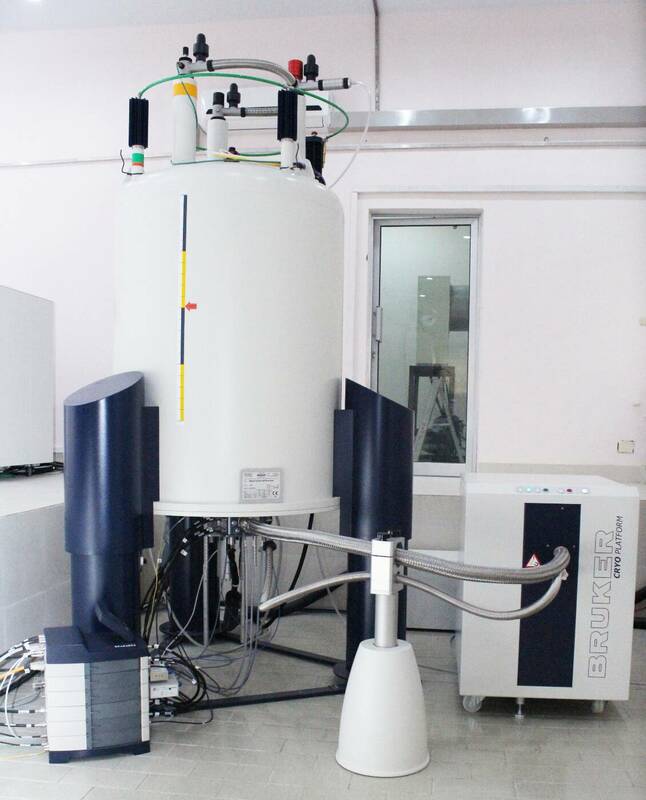 The new 800 MHz NMR instrument has recently been installed. 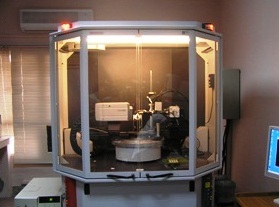 The NMR instruments are accessible to trained users 24 hours per day, year-round. The Facility also serve corporate and industrial clients, we offer a full range of NMR spectroscopy service options from routine 1D proton spectra acquisition and interpretation to complex 2D NMR analysis for the verification of their products as well as contaminants. 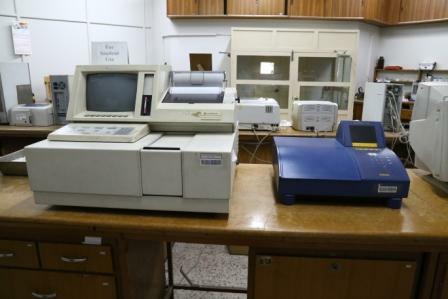 The Facility provides on request training to the researcher all over the country as well as to the researchers of our brother Muslim countries to enable users to independently operate the spectrometers. 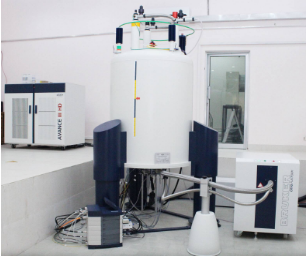 Welcome to the website for the mass spectrometry center at the HEJ Research Institute of Chemistry at the University of Karachi. This laboratory has instrumentation and expertise for performing a wide range of mass spectrometry measurements. This web site provides basic information required for submitting samples for analysis, as well as a tutorial on available ionization methods and interpretation of results. ONE JEOL JMS HX-110 with GC. TWO JEOL JMS -600H with GC. ONE THERMO FINNIGAN MAT 95 XP with GC. 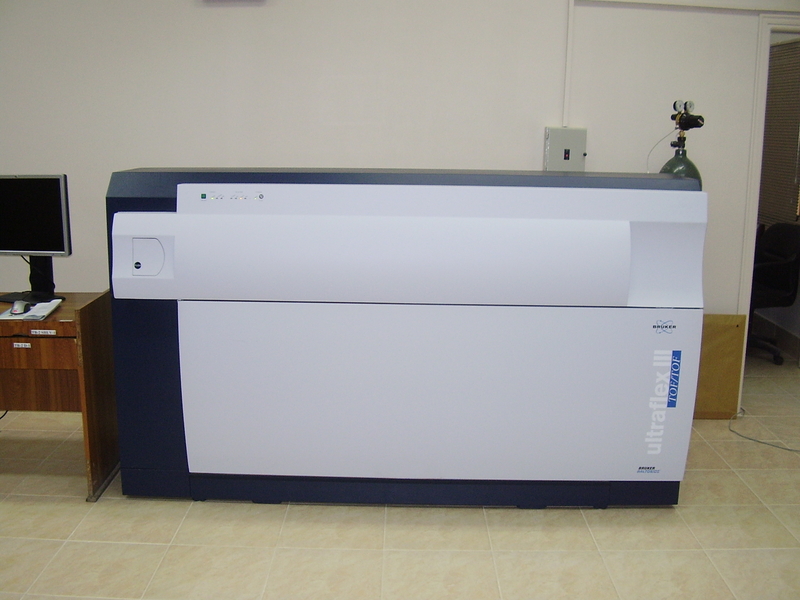 ONE BRUKER DALTONIK MALDI MASS ULTRAFLEX III TOF/TOF 200, SYSTEM. 10.Liquid Chromatography - Mass Spectroscopy (LC-MS) with E.S.I. 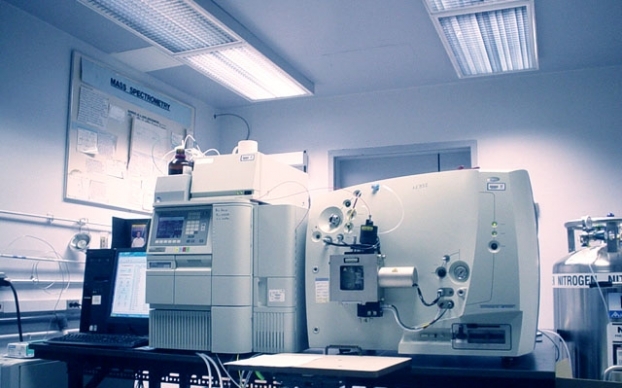 Unless samples are introduced into the mass spectrometer by either gas or liquid chromatography, samples with multiple components generally give complicated mass spectra that are difficult to interpret reliably. The purity of all samples should be assessed by NMR and/or chromatography prior to submission for mass spec analysis. Impurities are especially important for ESI and FAB analyses because one component can suppress the signal for another component.  Signal suppression may vary with the amount of sample used for analysis, with less sample often leading to less suppression. Finding different peaks in a spectrum when the same sample is analyzed multiple times may indicate that the sample contains multiple components. Good sample preparation procedures are essential for good mass spec analyses. Common sources of problems include contamination by materials extracted from containers, vials, tubing etc. used to prepare or store the sample. Organic solvents can extract plasticizer from many plastic containers. EI mass spectra of common phthalate plasticizers have peaks at (ask Yaqub John for masses). Acidic solutions can extract large quantities of Na+, K+, etc. from soft glass containers. These salts can be highly detrimental for ESI and FAB analyses. Concentration of large volumes of solvent makes this problem much worse. High concentrations of salt can often be detected by a high abundance of sodium or potassium adducts in ESI and FAB spectra. In the case of FAB, these cations can replace the proton in matrix cluster ions. For example, the sodium adduct of the glycerol matrix peak at m/z 185 has an m/z of 207. In general, peaks differing in mass by 22 or 38 mu usually indicate sodium or potassium adducts, respectively. High concentrations of salt can be removed by reversed phase HPLC, or by similar solid phase extraction procedures using Sep-Paks or Zip-Tips. 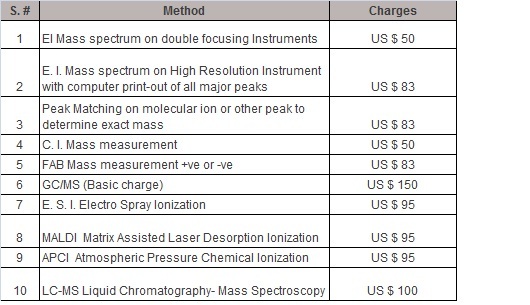 Although picogram quantities of many compounds can be detected by mass spectrometry, it is useful to have at least 0.1 mg of material submitted. The quality of ESI and FAB spectra depends very much on the amount of sample introduced into the mass spectrometer. Too much or too little sample may lead to unsuccessful analyses. In the case of ESI, we request that you submit exactly 0.1 mg of material. Since sample introduction into the mass spectrometer usually requires dissolving the sample in a suitable solvent, it is essential that you indicate which common solvents will dissolve your sample. The single-crystal X-ray diffraction laboratories at the ICCBS provides access to the state-of-the-art X-ray diffractometers, and offers technical assistance in crystal growth, data collection, and structure refinement. The laboratory is open for collaboration to all structural chemists both at national and international level. Our X-ray laboratories located at the H. E. J. 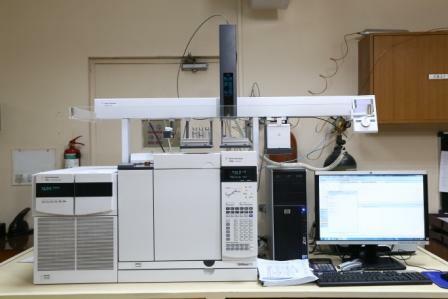 Research Institute of Chemistry and Prof. Dr. Atta-ur-Rahman Laboratories has one brand new Bruker D8 VENTURE and one Bruker SMART APEX II Diffractometer, respectively. 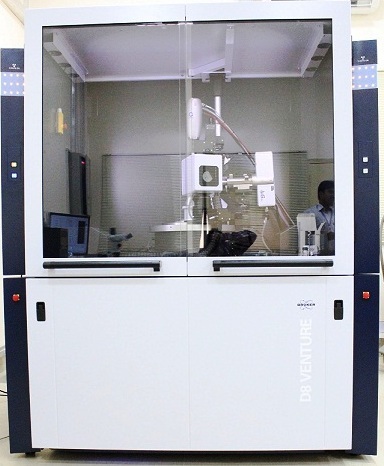 The D8 VENTURE is equipped with new PHOTON-100 CMOS detector, high brilliance Cu microfocus X-ray sources and Oxford cryosystem low temperature device, whereas, the Bruker SMART APEX II is equipped with CCD detector and Mo X-ray source. Both laboratories are providing crystal structure determinations (80-400 K) of organic molecules including absolute structure determination of biologically active compounds.